1 inch and 2 inch x 150 foot rolls of SOLAS Coast Guard Approved Reflective Tape. For land and marine applications. 900 plus Candle power. 1" - $109.99 or 2" - $179.99. Self Adhesive. 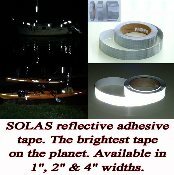 1, 2 and 4 inch x 30 foot roll of SOLAS Coast Guard Approved Reflective Tape. For Marine and land applications . 900 plus Candle power. "SELF ADHESIVE" Tape.